This example shows how to identify the parameters of a supercapacitor. Instead of collecting voltage and current waveforms from a real supercapacitor, the example generates voltage and current waveforms by running a simulation of a supercapacitor using parameter values that are already known. Then the example applies a parameter identification methodology  to the waveforms. To assess the accuracy of the methodology, the example compares the identified parameters to the known parameter values. 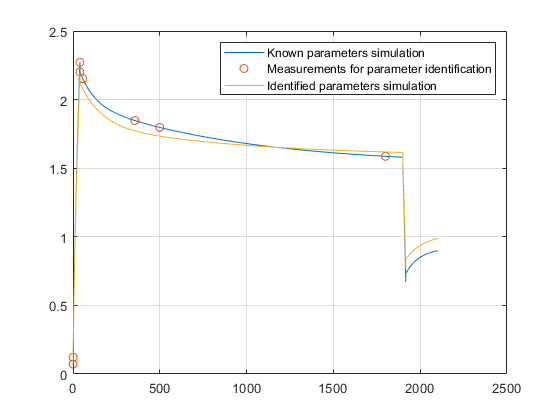 The example also shows how to further refine the parameter values using the Parameter Estimation tool provided by Simulink® Design Optimization™. Collect voltage and current waveforms from the supercapacitor. Identify parameter values using the waveform data and the methodology described in . Generates voltage and current waveforms by simulating a model that it configures using known values for supercapacitor parameters. Identifies supercapacitor parameter values using the generated waveform data and the methodology described in . Configures and simulates the supercapacitor using the identified supercapacitor parameter values. the data generated using known parameter values and the data generated using identified parameter values. the known parameter values and identified parameter values. If the accuracy is not sufficient, you can use the Parameter Estimation tool from Simulink Design Optimization to improve it. Use the identified parameter values as the starting values for the optimization. 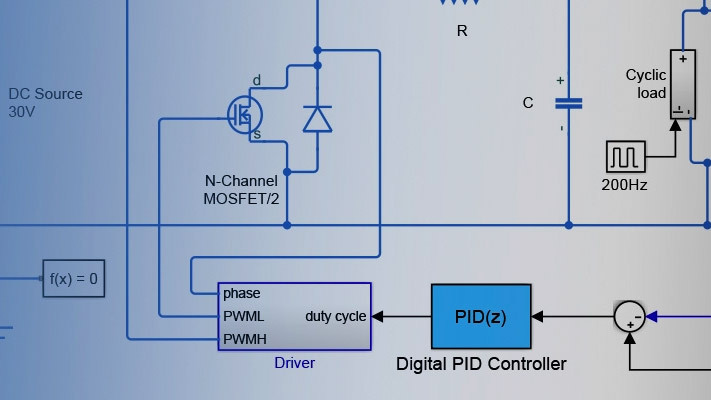 Generate voltage and current waveforms by configuring and simulating a model using known values for the fixed resistances, fixed capacitances, and voltage-dependent capacitor gain parameters of the supercapacitor. Model the input current, configure the physical characteristics and self-discharge resistance of the supercapacitor using realistic values. 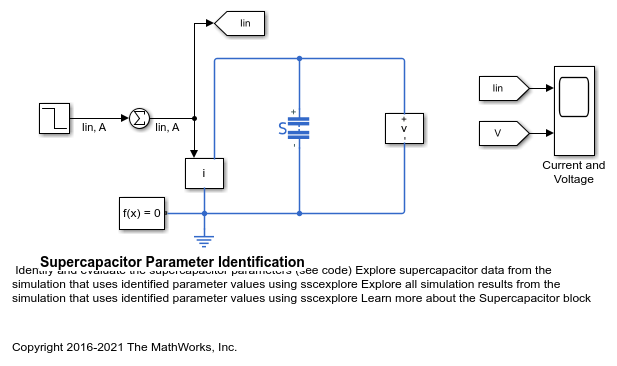 % Configure the supercapacitor using known parameter values. % parameter values identified using the methodology described in . % Specify input current by configuring the Step block. % Specify the physical characteristics of the supercapacitor. Using the waveform data from the simulation, apply the methodology described in . During the first stage of the identification, a fully discharged supercapacitor is charged with constant current. The method assumes that the immediate branch stores all the initial charge because the time constant for the branch is relatively small. During the second stage of the identification, charge redistributes from the immediate branch to the delayed branch. Delayed branch parameters are calculated by taking measurements of the hold charge characteristic. During the third, and final, stage of the identification, charge redistributes from the immediate and delayed branches to the long-term branch. Long-term branch parameters are calculated by taking measurements of the hold charge characteristic. Configure and simulate the model using the identified supercapacitor parameters. Then, to evaluate the accuracy of the identified parameter values, compare the waveform output to the data generated by a simulation that uses known parameters. % create copies for easy reference. % Simulate the model and store voltage and current waveforms. If the traces are not similar enough to meet requirements, then the identified parameter values can serve as initial parameter values for the Parameter Estimation tool from Simulink Design Optimization. Display the parameter trajectory created using the Sum Squared Error cost function and Nonlinear least squares optimization method. Zubieta, L. and R. Bonert. "Characterization of Double-Layer Capacitors for Power Electronics Applications." IEEE Transactions on Industry Applications, Vol. 36, No. 1, 2000, pp. 199-205.